Number 5 Type Collection: How do you track visitors or readership? With a growing number of sports cards bloggers out there--trust me, there are hundreds, if not thousands--I often wonder how many keep track of their readers. Sports and non-sports cards still sell at Targets and Wal-Marts around the country, but it's not clear how many folks also read about the hobby in their spare time. I included visitors and readership in the title, since blogs have both occasional visitors (often via search results) and older-school, read-it-all subscribers. On Blogger.com-hosted sites like this one, Google provides the easiest-to-find tracking tools. I took a quick screenshot of each and linked to more info. This dashboard tracks my last month of "hits," which I think are visits by unique visitors. Note the significant drop between July 5 and 17, during my summer posting vacation. It jumped back to normal levels upon my return, showing that consistent work makes a difference! Google Analytics includes a ton of info and reports. This single graph only scratches the surface. 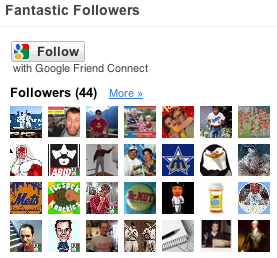 These 44 folks all created a Blogger account and chose to Follow my (or your) site. They might not read each post, but are adding their stamp of approval to what we do. It's up to each blog author to include this or not, using the layout designer. The icons do occupy screen real estate and look a little primitive, so I can understand folks omitting it. Find this graph by selecting the feed name from Reader's sidebar and then clicking Show Details in its upper-right corner. The blue and orange bars compare how often this site publishes something to how much I read. 61 folks total get The #5 Type Collection via Google Reader; 60, if you don't count me. These are just what they sound like--folks who took the time to read your post, endure Google's "prove you're human" shenanigans, and add a thought of their own. The first 4 methods keep a finger on the pulse of blog readers and how often they visit. Got any more readership trackers you use or want to know more about? Let me know below! Awesome breakdown Matt. I use a variety of those methods to see who checks out my blog and what's popular. Yeah, cool breakdown... I was very into my blogs numbers when I was posting on a daily basis. I like the follower option from blogger and I do show the icons on my front page and I do get excited with each new avatar that pops up. I also follow how many google feeds subscribers there are. That number jumps around but I tend to have 1.5 times more subscribers than followers. Most "followers" are bloggers, too, while the subscribers I think are strictly readers. I used stat counter dot com. ITs free and shows the pattern. When I posted daily on 4 different blogs I averaged 500 visitors daily. Now that I post short ones every other day, I average about 70 visitors. Comments are AWESOME but come seldom. I also have a folder in my inbox dedicated to email responses to blog posts. It is foolish I guess to get so into tracking so heavily for something we do for free, but I always like to know if folks are reading or at least clicking... Cool topic and good advice. Have a great weekend! I had a minute, so I thought I would add some more... When my page was getting a lot of action people used to write to me and ask how they could attract more readers. I wish I knew for real, but I will share what I did to boost readership... Read and follow other peoples blogs. For every new follower I get I check to see if they have a blog and I generally follow it to return the favor. 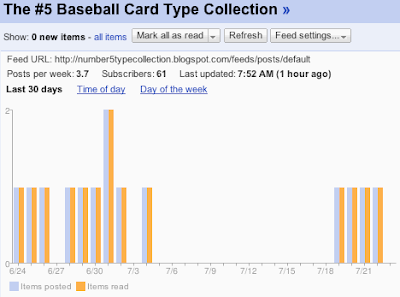 I follow 300 card blogs and actually do read them all. Sometimes only once per week, but I always check them. Trade if you can. That generally generates a trade post with a link to your site which increases traffic. COMMENT on other blogs. We all love feedback and it starts a conversation and establishes a connection. Post often. The more you show up on blogrolls the more people will check you out. You only get what you put in. If you never comment on other blogs you can't expect others to always comment on yours. If someone posts a trade from you, it is good blogging manners to acknowledge that post with a comment, too. The final thing is to have fun with it. Blog because you LOVE it not because of hits or followers. If you truly enjoy yourself, the rest will fall in line. I use SiteMeter to keep track of my hits. I had a longer reply typed up but decided to post it to my blog once I saw what milestone I passed sometime today (see it at: http://fanofreds.blogspot.com/2010/07/another-blog-milestone.html). Good question! I use sitemeter.com and statcounter.com (2 different blogs). Interesting to see when people visit and where they came from.